Following last weekend’s findings of large marine debris on the reefs of Pulau Hantu, and Monday’s scan of the reefs by MPA to locate and confirm the location of this debris, Hantu Blog volunteers returned on Saturday with scientists from the Blue Water Volunteers and NUS Raffles Museum of Biodiversity Research, to observe and assist the salvage operation by MPA and Singapore Salvage Engineers (SSE). It was an exciting and learning experience for all of us! 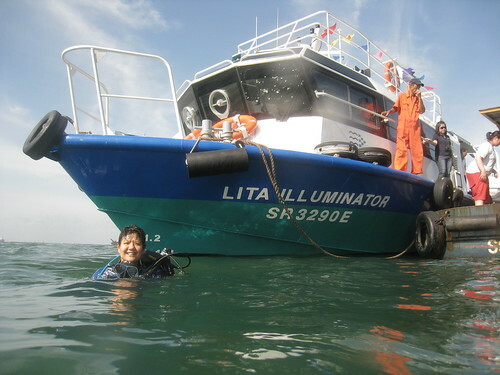 Not to mention, a privilege to get to dive off their super trick vessel, Illuminator, which had inboard Wifi! Our team was also joined by staff from Sentosa Development Corp, who’s in-charge of managing Pulau Hantu. 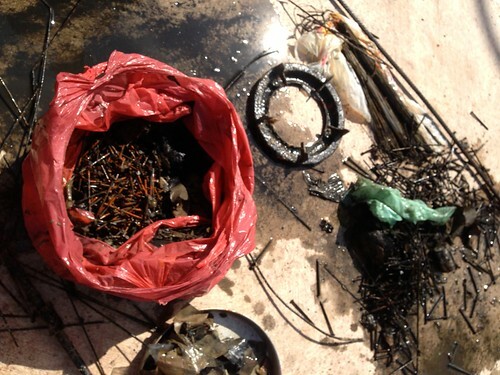 They were keen to learn more about the kind of debris that is impacting Hantu’s reefs. There were three vessels involved in this operation – The Panduan is another MPA vessel that was needed to lift the reinforcement bar (rebar) out of the water and deliver it back to the MPA base at Pulau Brani. The third vessel was a small work craft for the salvage divers. 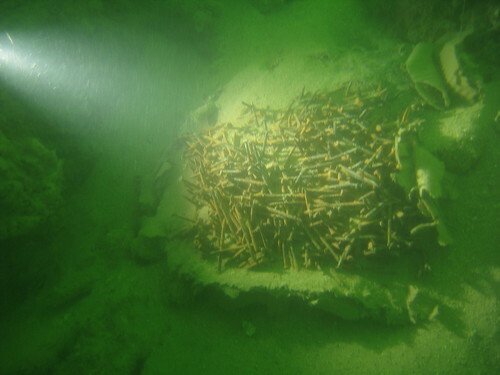 One of the cool things about this operation was that MPA consulted with marine scientists at NParks on the best method to remove the rebar from the reef since the process might potentially impact the reef. After some discussion it was decided that the best method was to gently lift the rebar off the reef with lift bags and float it over to a barge that would be anchored out at sea. As the rebar is located in the shallow reef area, anchoring a barge that requires two large anchors, would damage the reef. This recommendation was improved upon with the deployment of the Panduan, which uses a mooring sinker instead of an anchor so damage to the seabed is minimized since a sinker won’t drag or scrape the seabed the way anchors do. 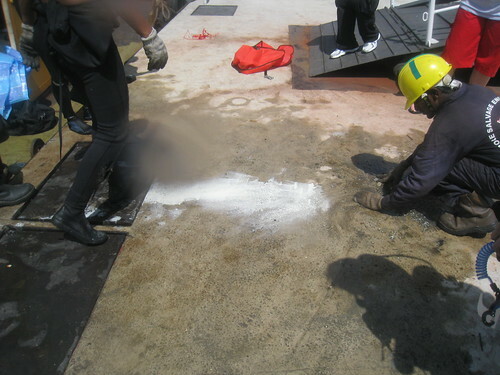 Before we entered the water, we were briefed by the SSE about the salvaging procedures. 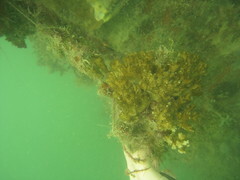 In return, we shared with them that before the rebar is to be lifted, we would check it for any reef life that might have become tangled or critters like seahorses that could potentially be using the rebar as a holdfast. SSE had prepared lots of notes collected from the scan on Monday and from our Blog as well. 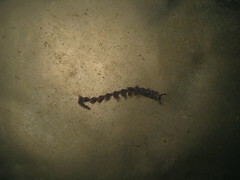 Unlike other salvaging operations they are used to, SSE divers are usually working blind, and notes from the scans are all they have to work on in terms of locating the articles they need to retrieve. 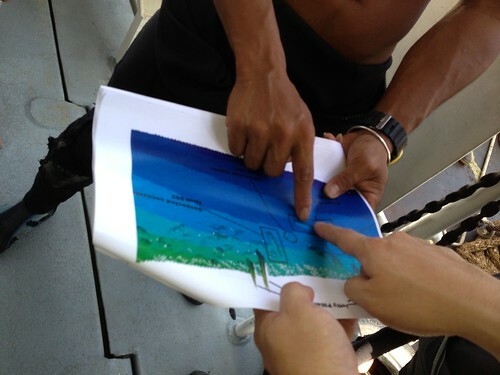 This case was unique because we already knew where it was, which made the job a whole lot easier and faster as we could help guide the SSE divers to the specific sites. We descended together and thanks to Cindy’s memory and her sharp eyes in the murky waters, we located the rebar in no time at all! 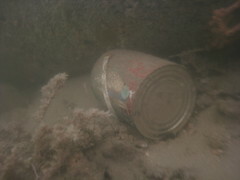 As we’d observed last weekend, there were several boxes of nails and large paint cans strewn all over the reef. There were also paint rollers, several bottles of what look like paint thinners, a sack of granite chips, and several sanding and buffing disks littered under the jetty. Many divers working together made the work swift and easy. So Abby and I managed to spend some time removing just a small fraction of the massive amount of fishing wire that was tangled throughout the reef close to the jetty area. We used one of the paint buckets to contain the fishing wire. 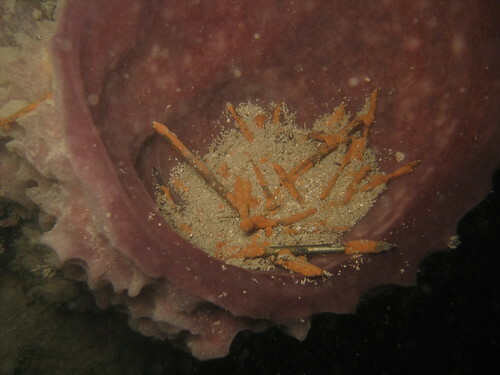 Sadly, many coral had been dislodged by the wires. 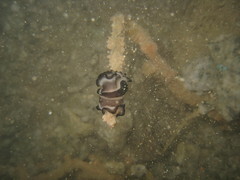 Once coral gets tangled in the wire, the wire becomes weighted and this causes more coral and sponges to get tangled up. These seemingly benign nylon string creates a very hostile environment for marine life as they take an extremely long time to disintegrate. Long after previously tangled debris rot away and disintegrate, the strings “live on” to continue their deleterious existence. While some of us worked to remove the smaller debris, the SSE divers were rigging up the rebar to prepare it to be floated and lifted away. Cindy and I were right next to the divers as it was slowly and gradually lifted up to the surface. 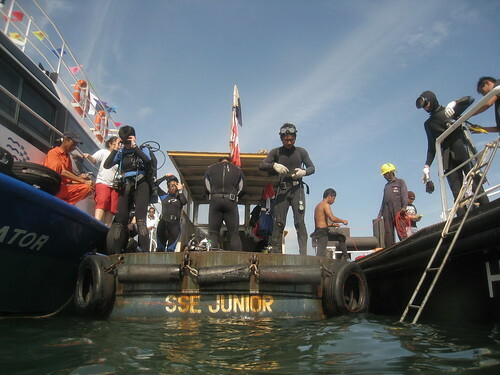 SSE divers were advised by MPA to lift it slowly so reef damage is minimized, and that’s exactly what happened. I was really impressed to observe the rebar being lifted in such a controlled manner. The SSE divers were like seals underwater, maneuvering and controlling the ascent of the debris. I’ve worked with small lift bags before and I’m really quite hopeless at it. Because air expands as the lift bag raises from deeper to shallower waters, it really requires lots of skill and practice to know just how much air to add to the bags for the weight you are trying to overcome and the depths that you are working within, to allow a steady and controlled ascent. Apart from the SSE divers there were other staff on board the vessel to give surface support once the rebar hit the surface. As the surface crew took care of the rebar, the divers returned to the reef to remove whatever additional debris we could find that was not encrusted with living material. There were lots of rusty nails everywhere! Some had collected within the sponges and two whole boxes were found in bags and boxes! We encountered some lifeforms along the way. We continued to collect debris until we were all low on air and had no choice but to surface after our safety stop. It was a really different kind of diving that we did today – the Hantu Blog focuses on guided tours during our regular dives, this means that we don’t often have the opportunity to spend the required time removing debris from the reef, and in this particular case, we certainly didn’t have the manpower or equipment necessary to remove large debris like the rebar. Having the support of MPA and SSE was real super. Removing debris from the reef requires some discernment. 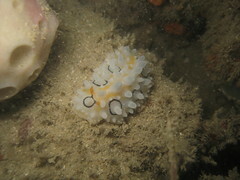 Some debris can serve as habitats for opportunistic lifeforms on the reef. Once debris becomes encrusted, we do not remove it. Material that can’t be encrusted like silicone and plastic compounds are also removed. The paint rollers left a trail of paint particulates in the water and on the surface. 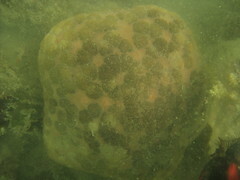 Since the paint needs air to dry, it never solidifies and will continue to smother the reef. Unlike recreational diving, there’s a lot of heaving-and-hoing as we move the often heavy debris up, down and along the reef, and into their collection baskets to be lifted to the surface. This made us really tired and hungry… so it was really wonderful that Joanne from MPA had the foresight to prepare a whole lot of food when we ended our dive. There was actually mee siam! I can’t remember the last time I had mee siam after getting out of water. How nostalgic. There was also Nasi lemak and loads of curry puffs and other wonderful fried and oily tasty yummy things. A big THANK YOU to MPA, SSE, NParks, and SDC! It was such a pleasure to have been able to do this together!